Just after Google has launched its new Inbox mail service, an ameliorated version of the Gmail, International Business Machines or IBM has come up with another new solution for the email service- the online email named as Verse. The Verse email service is coming as soon as next week and we will enlighten you with information about this new project. Email is undoubtedly a phenomenal innovation but for the past decade, the email technology has not witnessed any figurative change in its technology. Hence, almost all leading companies like Evernote, Asana, Slack, Acompli, Baydin, and Google have decided to incorporate new tool in the technology so as to make it more user friendly rather than fringing it to just a jejune list of emails. Carolyn Pampino, IBM’s director said, “Email clients have been around since the ’70s and they haven’t changed much. 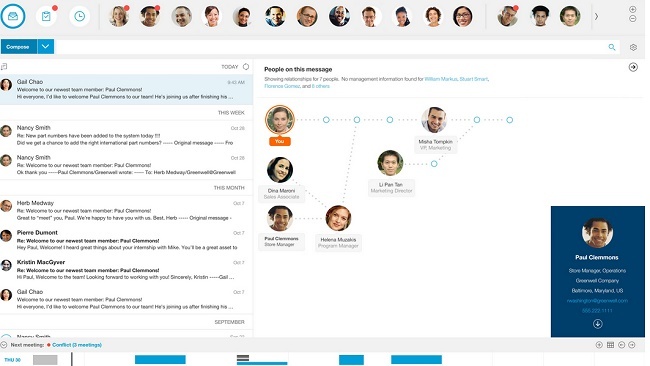 You get a flat list of emails that you have to triage, with no sense of where you need to focus.” In IBM’s Verse, the interface will be more picture based and the image given here exemplifies it. The contacts will magnify the images more than the message sender’s name. The email will also show the track of the message being forwarded or the the people in the conversation in a vividly described picturesque graph. Verse will also foster the concept of personalized email by endorsing a people-centric perception. The important emails will be prioritized and will be brought to a separate column much like Inbox. Verse will also include the Cloud type storage service for its mail client. Users will be able to upload files and share them with others.